While I was out of the country, in Malaysia, my cousin sent me a private message asking me to buy for her a certain whitening product. 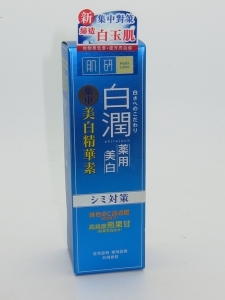 That product was Hada Labo’s most famous whitening product line up Hada Labo Arbutin Whitening Lotion. It is said to be Japan’s #1 best selling product, and so I purchased and used the product. then went home without really checking the item since I have great trust in Watsons products. When I got home I noticed that it was liquid. At the back of my mind I was thinking *WTF* as for twas the first time I ever saw a “lotion” that is like water. So, I researched online and found out that “lotion” for the Japanese is also a “toner”. form. Three (3) days after using the product my face was glowing. It didn’t significantly become whiter or fairer but it has this healthy glow, so I continued using the product on my face and on my skin. After two (2) weeks I got some red bumps on one arm. It would vanish every now and then but when I’m using the “lotion” it’d itch once again and the bumps will be visible again. the doubt. I’m continually using the product just to see if there will be any improvement but be aware that I’ve been using the product for more than a month now. I also noticed that the product I purchased says at the back “Made in China” but I purchased the item in Watsons. Anyhow, I’m going to purchase another Hada Labo Arbutin Whitening Lotion that states “made in Japan” at the back and make another review if that one work better than the one I am using. This lotion is looking good but its have no better results i used that one . that has not the well effects after 1 month . i really not like that one .Try others is best choice . I hope you have found the product that works best for you. It was an odd texture when I received it, but I will try it before throwing it away since I paid for it. I always research first and ask or look for testimonials before i use a product specially if its a foreign product. the effect of it to your skin is maybe because its compatible for Japanese/Chinese skin.by its geographical reasons like weather or some sort like that. Before going for any expensive skin whitening product, one must try saffron, milk and honey. This is quick and easy home made mask which gives glow and moisture to the skin. Just we need three-four strands of saffron dipped in two teaspoons of warm milk and honey kept aside for 15-20 minutes so that saffron qualities get well into the mixture. Apply the mixture on face and neck for 20 minutes and then wash with plain water. Do not forget to apply moisturizer after washing your face. For better and long lasting results repeat the process daily for 3 weeks daily. Yes. Turmeric has been a favorite, natural ingredient when it comes to skin whitening. It also has antibacterial properties which can help reduce acne. You can use turmeric alone, but you can also combine it with milk for moisturizing properties.